The flu-ravaged and freezing Northeast hasn’t been a terribly fun place to spend time this winter, so when the opportunity came to decamp for a weekend to Sarasota, Florida, my bags were packed before you could say “sunshine.” I departed for the land of warmth and vitamin C, visions of beaches and orange groves dancing in my head. When we touched down to blue skies and balmy air, I sent up a small prayer of gratitude. Swimming pools, wine tasting, and pink sunsets (at normal twilight hours, not 4 in the afternoon) filled the weekend, but the highlight—particularly to my palate, dulled by months of cold-weather root vegetables—was a 7 a.m. foray to the Sarasota farmers’ market that proved to be more than worth the early wakeup call. At the market, which was founded in 1979 and pitches its tents every Saturday from 7 a.m to 1 p.m., rain or shine, along North Lemon and State streets, the overwhelming visual impact was of red. Baskets of perfect red strawberries. The red-painted sides of the life-reviving Java Dawg coffee truck. And most of all, the tomatoes: amazing, awe-inspiring, plump red tomatoes. Disillusioned by many a broken, vine-ripened promise, I’ve been boycotting winter tomatoes for years. No matter how tempting they look in the store, once I get them home they’re unfailingly dry, hard, and bland. 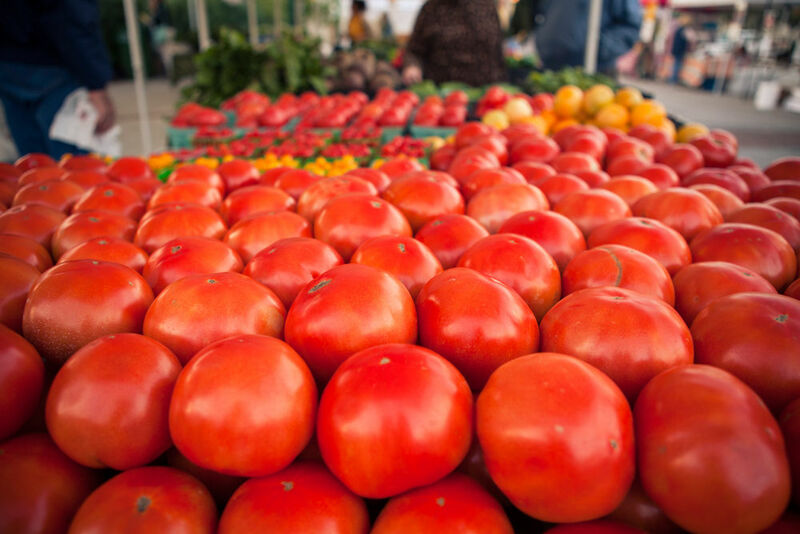 But I homed in, with tentative joy, on one particular table at the Brown’s Grove Farms stand, full of tender tomatoes the size of my fist, streaked with the almost imperceptible variations in color that come from ripening in honest-to-goodness sunshine. These were the real deal—and in that moment, I realized that the best part of this trip wasn’t going to be freedom from the burden of a wool coat or the chance to dig my toes into some sand.The best part was going to be eating things that back home in New York, I wouldn’t be experiencing again for months. The best part of Sarasota in winter was going to be eating things that back home in New York, I wouldn’t be experiencing again for months. Delighted as I was by the tomatoes on display, my happiness deepened when I learned that Brown’s Grove Farm is one of the suppliers for Jack Dusty, a newly opened restaurant at the Sarasota Ritz Carlton, where—luckily for me—I was planning to have dinner that very night. Without even seeing the menu, I knew I’d be ordering every tomato on it. The atmosphere at Jack Dusty is cool, blue, and seafaring—the restaurant takes its name from the nautical slang referring to the crew member responsible for overseeing the ship’s stores and dispensing the daily ration of grog—with a suggestion of waves and sailing history as briny and fresh as sea spray. Settling in to my seat, glass of Prosecco in hand, I began my mission to put some summer in my mouth. At the top of the list—and the menu—was the tomato burrata salad. Being primed all day, and then being presented with the idea of pairing tomatoes with a creamy-smooth ball of delicious dairy fats—for me, this was a certain kind of heaven. Served on a bed of spicy arugula, the tomatoes, lightly oven-cured to emphasize their sweetness, were mellowed perfectly by the rich burrata. Pairing tomatoes with a creamy-smooth ball of delicious dairy fats—for me, this was a certain kind of heaven. Next up was another salad (who says you have to stop at one?) in which tomatoes played a bright supporting role to cubed watermelon, with chile flakes adding just the right amount of heat, and a sweet, citrusy Meyer lemon oil adding a bit of the flavor of Florida to the plate. Jack Dusty’s executive chef, Dwayne Edwards, stopped by our table, suggesting that I order the kitchen’s daily greens, sourced from the farmers’ market. A mix that included spinach and chard, served with fluffy, salty grits—deliciously tender, cooked with mellow garlic and a slight tang to the broth (more tomatoes? I can only dream). Delicate but distinct, the greens not only provided my palate with a burst of phytochemical perfection, but also gave my jaw a break from the robust leaves and tough stems I’d grown used to over the cold months. To finish, another warm-weather treat: summery sorbets made with local citrus and berries, cleverly served sealed in individually labeled cans. My favorite of the flavors was a strawberry-lemon mix, bright and yet smooth—I remembered the heaping piles of local lemons at the farmers market and the vermilion abundance of strawberries, their combined flavors an ideal end to the meal, at once cooling and filled with the memory of the morning’s warmth. Boarding my plane back to New York the next day, I braced myself for—among other things—the cold, the need for inventive layering of clothing, and gray skies that darken early. I also prepared myself for a return to winter eating: kale and root vegetables awaited me at home, stalwarts that fuel my cooking until spring’s first shoots appear months later. But I also carried with me a secret: two quarts of strawberries, safely wrapped up in my luggage. They would be gone too quickly once I arrived home, but while they lasted, they would be perfect. _Saturdays, 7 a.m. to 1 p.m.
Mia Cabana is a freelance writer and former librarian living in Brooklyn, whose travel habits are influenced by a lifetime of watching educational programming on PBS.